Dr. Lingling Li, OMD & L. Ac. 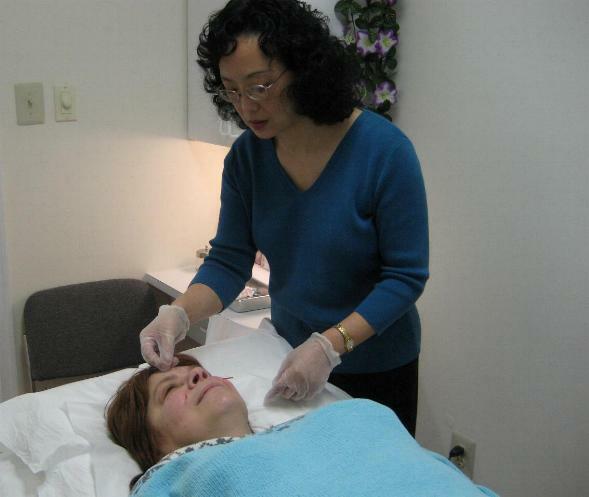 Dr. Li is seen inserting a needle into the acupoints in the forehead of a patient suffering from migraine. The doctor diagnosed the conditions causing pain and designs a series of acupuncture treatments to alleviate the problem. Dr. Li graduated from a prestigious Oriental Medical University in China with a MD in Chinese Medicine degree 27 years ago. She has been practicing Acupuncture, Chinese Herbal Prescriptions and Chinese Massage since then. She is a National Board Certified Acupuncturist & Chinese Herbalist and a Pennsylvania Licensed Acupuncturist. Dr. Li often gives patients dietary and lifestyle counseling. In China, she trained many students in the art of acupuncture from different countries. (1) Diseases of the Motor System: periarthritis of shoulder, cervical spondylosis, sprain, chronic neck and back pain, arthritis, accident or sports injuries, tennis elbow. (2) Neurotic and Mental Diseases: headache, stress, anxiety, fatigue, sciatica, paralysis, migraines, neurasthenia. (3) Other Diseases: digestive disorders, asthma, cholecystitis, arrhythmia,weight control, stop smoking, etc.. If you have any questions regarding your conditions and symptoms for Acupuncture or Chinese Herb Medicine treatment, please feel free to call: (215) 540-3755 for consultation and making an appointment.